Some time you will see the form containing the button "Add More" . This facility is provided for the user to get the values for unknown number of repeating for some information. for example when you are asking to get the projects details from user, you need to put the option to add the more project for the user since you don't known how many projects user have. 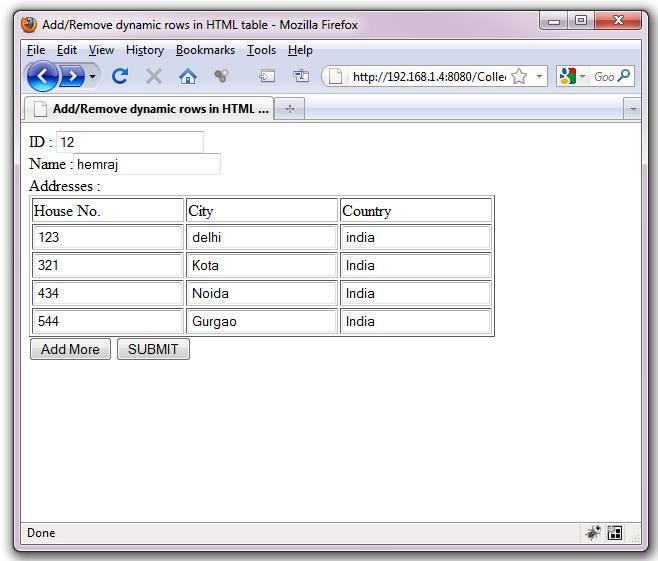 In the HTML form, you repeat the particular section to get the multiple values for those elements. In Html page , you can put the option to add new row of elements or text fields by writing the java script or using JQuery API. Now, the question is that how to capture the values of dynamically generated text fields on the server. Using the servlet programming you can get the values by using getParameters() method that resultants the array of the parameter having the same name. But this limit you to naming the text fields in the HTML form. To ally this approach, you have to take the same name for the multiple input type fields those will have the similar values. After getting the server side, you need to process these type of fields manually using lots of programing approach. So it is not a feasible solution when there are other approaches available like using Struts2. Here, I am explaining the approach for the getting over from this problem. We have struts2 MVC framework that has capability to intercept the request parameters submitted from HTML from. It maps the values to the action or bean properties automatically without writing much codes. You need to following some naming convention only. Struts mapping the values of the input type elements of the HTML form to the properties/variable of the action object automatically if you have kept the name of the input type fields and properties same. You can read the struts2 documentation to handle the something in multiple ways. Now, if there is some multiple fields in the HTML form having repeatedly values, Struts maps those values to the Collection type properties in the Action Object. So to get the values of the field having multiple values but the same name, take the List type variable in Action class. If some properties of the action class pointing other object, struts2 handling it using the naming convention of the input type field. At the server side, struts2 mappes value of this text filed using OGNL . In the above statement, user is the property of the actiion object and addresses it the property of the user object. Addresses object contains houseNum property in which the value of the above text field will be mapped. If the User object has the List of Address object , Struts2 to automatically maps the values to this properties using the following naming convention. The value of the text field will be mapped to the property of the first object of the address List contained by the user object. Here is an application that has the form with id and name text field and option to adding more addresses. 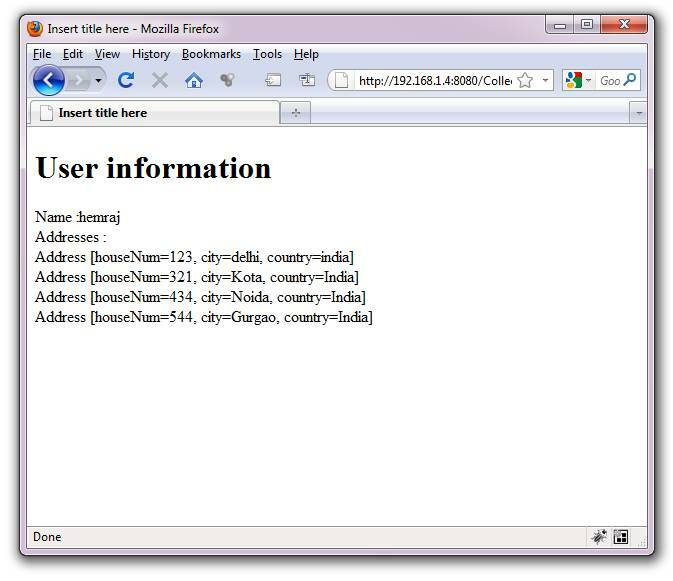 User can address any number of address row and all values are processed by server. Here, I am displaying the submitted values in result page but use can change the codding to persist them to database. Very helpful example. I have sorted out my problem now. Hi swathi,I am reading values in UserAction class and UserAction class is storing values in User object and Address object. Second page is displaying values from user object only. To see the values in action class, write System.out.println(user); in execute method of UserAction class. How can I display the same values on the same page, on the same text fields and not in a label form? Since All data captured from the form is mapped to the user object in UserAction class, you can write the simple Hiberntate code in execute method to persist the user object in database. Just write down following codes in execute method to insert the data of form in tables. Actually data goes to 2 tables one is Usertable and another is addresstable. you can create the table by seeing the insert query parameters and user this code to insert the data. //Insert the data of user object,id value can be set to increatment or you can provide unique value yourself as it is a PK. //now insert the multiple addresses for this particular user. You have to user user Id as foregain key in address table to identify the addresses for particular user. This makes easy to read data separately according to no. of rows. Thanks by the idea !!! But if you have a esample using struts1 it would be nice ! Can we retrieve rowcount value from index.jsp to Action class? this field will be submitted alongwith form and you can get this value in action class property "rowCount". 2nd approach:- if you want to get the number of rows, then just get the size of collection addresses in user object. How to write such program using servlet and jsp, I am trying it since 10 days but i am getting trouble to do it. I am trying to devlope onling billing system in which user can add multiple rows as requirment, but i am stuck here. It will return array of string having multiple values of a input box name. I am stuck badly. If you could help, then it would really be great. the collection comes up empty in the action class..any idea on why that could be?